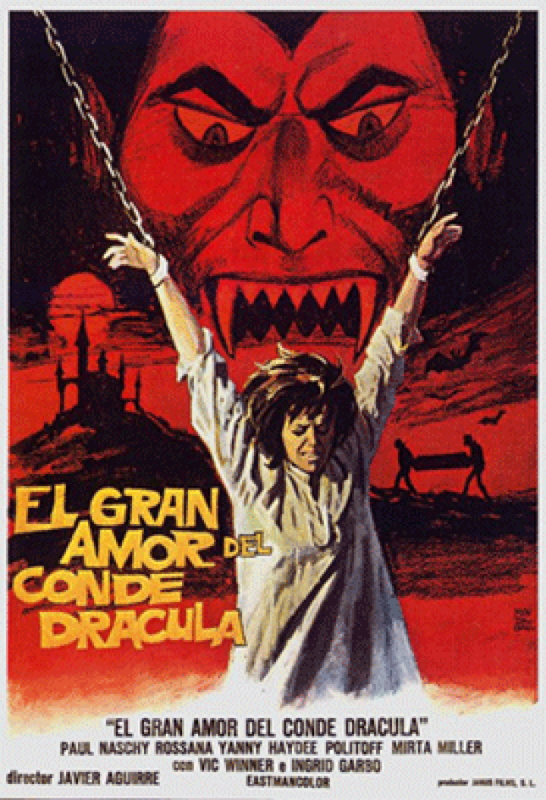 THE GREAT LOVE OF COUNT DRACULA *** (a.k.a. Count Dracula’s Great Love / Cemetery Girls) Spain 1973 83 mins Dir : Javier Aguirre. Paul Naschy’s take on the Universal / Hammer Gothic horror cycles doesn’t dawdle on delivering the goods: the very first scene features open throat wounds and an axe in the face, followed by a lone guy travelling for no explained reason with FOUR young women in one of those carriages driven by a growling lunatic through Dracula country. No sooner has said lucky man regaled the ladies with tales of the local vampire than the coach has crashed, and everyone has to take refuge at an abandoned sanatorium overseen by a suave doctor (Naschy) who is actually Dracula in a cunning disguise. Naschy, sporting a red-lined cape, looks at his most dapper and handsome in the title role and, en-route to a dissolve-heavy climactic disintegration modelled on Hammer’s 1958 DRACULA, the movie finds fresh slants on the familiar material. There’s a characteristic Naschy emphasis on breast-baring / munching and orgasmic, sexed-up vampire scenes, including girl-on-girl interludes and the usual pleasure of watching Naschy himself getting his end away on a regular basis. (Though, in a self-mocking moment, an amusing dialogue exchange suggests not all the girls are in lust with the Count : “I like my men slimmer and taller!” one notes!). The dopey, overdone romantic angle drags a tad, but the final reel has a marvellous scene of Dracula’s well endowed, uniquely levitating brides licking the blood from the wounds of a tortured / whipped captive virgin…right before an original conclusion in which he stakes himself in the name of love. Soppy old sod, that Paul Naschy.